Duration : 13 x 44 min. Producer(s) : Radar Cinema e Televisao Ltda & 4469101 Canada Inc.
From the Emmy Award nominated Brazilian production Radar Cinema e Televisao , the Canadian producer of Dragon, Cité Amérique and the creator of Franny's Feet, Cathy Moss, comes this brand new animation series set in a daycare center inhabited, unusually, by dogs of all breeds and characters! Every morning the dogs' busy owners drop them off at daycare and every evening they return to pick them up. In between, the dogs spend their time playing together, learning about each other and the world around them, and getting in - and out - of merry mischief. Through the guise of animated dogs, this series teaches children that we live in a multi-cultural world where respecting differences and accepting others and ourselves is not just polite etiquette but a necessity. 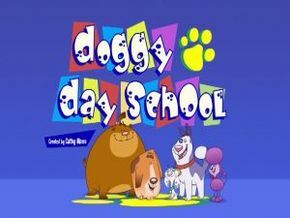 Doggy Day School is designed to encourage children to have a view of the world where diversity is something to be celebrated. Some of the themes explored in the series: Making someone feel good, learning to cooperate, friendships and distractions help others feel better, telling the truth, cleaning up and respecting others, showing kindness….